The Ford Ranger was made from 1982 until 2011. It was first available just as a two-wheel drive truck, but later that year it was available as a four-wheel drive model. Then, it looked very similar to the F-series line of trucks. It was first offered with a 2.3 liter 4 cylinder engine that only had 80 horsepower. Later, the 2.8 liter V-6 with 115 horsepower was made available. Transmissions choices were the four-speed automatic or the optional five-speed. 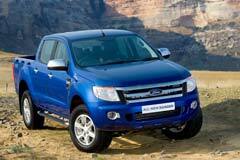 Four models were offered: the XLT, XLS, XL and base. There were not many changes until 1989, when a new body style and anti-lock brakes were introduced. In 1990, twenty gallon fuel tanks were standard and a new 4.0 liter V-6 with 160 horsepower engine was optional. Over its twenty-nine years of production, the Ford Ranger received many updates, especially in 1993. Here it received new styling. The Ranger was given a rounded front, along with new front and back light clusters. In 1995, driver airbags became standard. In 1998, the Ranger received another style change. Smaller body changes were made from 2001 to 2006. The last generation (2007-2011) of the Ford Ranger offered both short and long bed options, as well as two cab sizes: standard and supercab. Available engines were the 98 horsepower 2.3 liter 4-cylinder, the 145 horsepower 3.0 liter V6 and the 160 horsepower 4.0 liter V6. Also, available were the 4-speed, 5-speed and automatic transmissions.